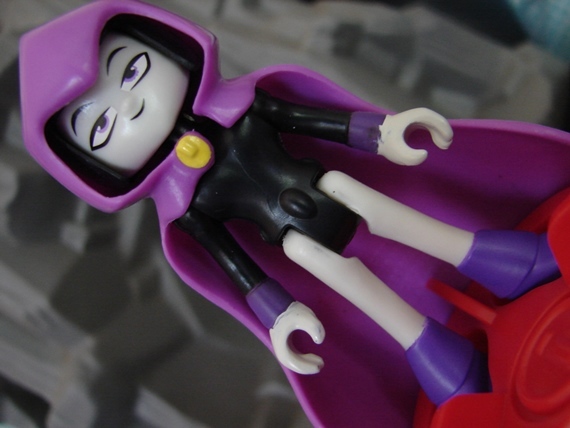 Toyriffic: Imaginext Teen Titans GO! 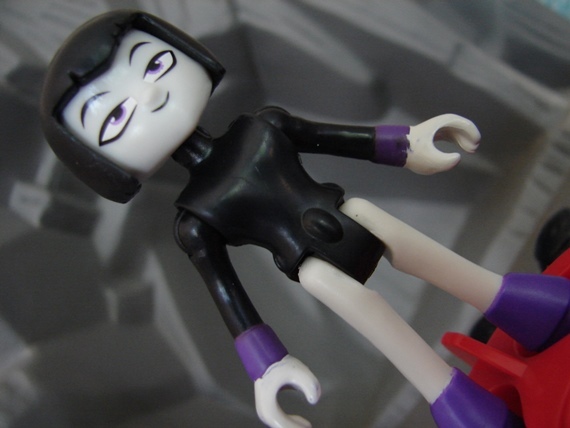 Raven Review :: Azarath, Metreon, Zinthos! 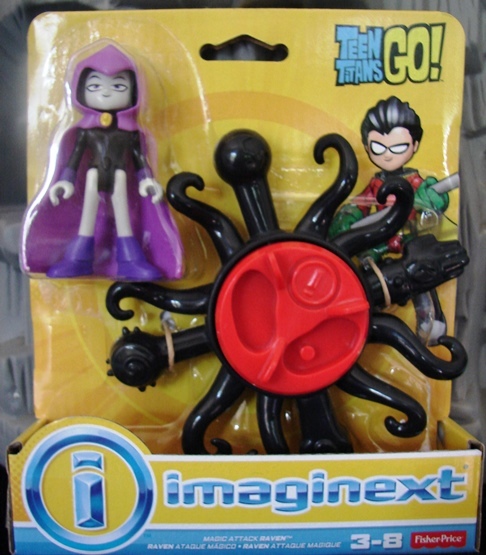 Imaginext Teen Titans GO! Raven Review :: Azarath, Metreon, Zinthos! 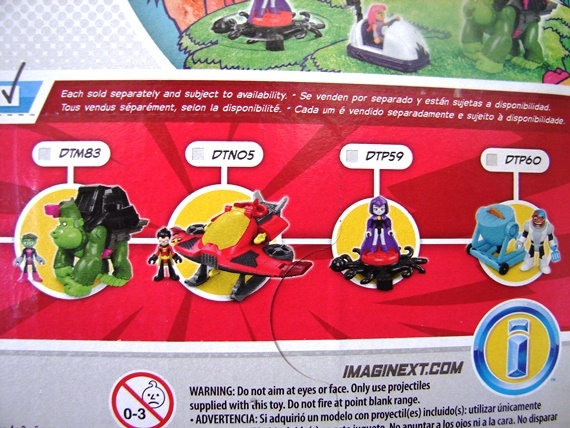 Imaginext is now in the Teen Titans GO! toy game, and they've jumped into the ring swinging! The sets are hitting retail now, being spotted at K-Mart and Toys R Us so far. I found the single figure sets of Raven, Starfire and Cyborg at Toys R Us yesterday. No sign of the bigger sets though. I picked up the Raven and Starfire sets immediately, as I am both surprised and impressed that the girl characters were both released in the first wave of figures, and as single figure 'starter set' releases to boot! Had you asked me to predict the release pattern of these figures, I would have said Raven would be in a later wave (or never released at all if the series wasn't popular enough for multiple waves) while Starfire will only be available if you buy a massive, possibly second-time-around-repainted playset. Times, are they a-changin', maybe? Or is the release of both Raven and Starfire right out the gate simply a toy collecting anomaly? I don't know, but I'm not complaining. 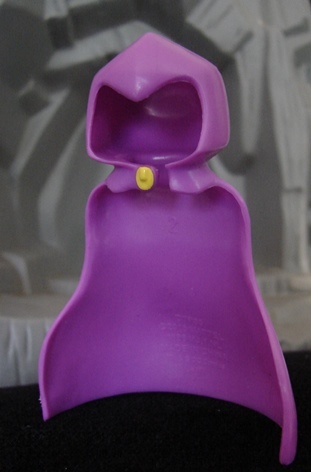 The sullen, grouchy, goth, half-demon Raven is a must have for any Teen Titans GO! fan. Who doesn't love her dead-pan delivery and God (Devil) like powers? ...her hood is designed to be removable. So the shadow would not have worked with the hood off. Perhaps there will be a variant, or I'll get a second figure and paint her, as I imagine many collectors will consider doing. I'm just happy the hood is removable, as this fact opens the door for a Lady Legasus repaint! Of course that would also be a pretty simple custom, in the off chance I end up with multiple Ravens. 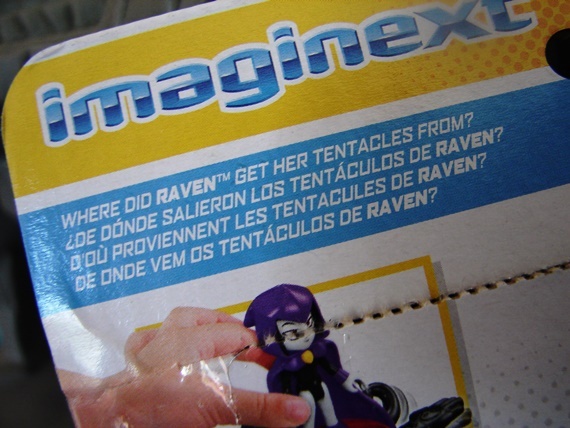 Hahaha, 'Mommy, where DID Raven get her tentacles from?' 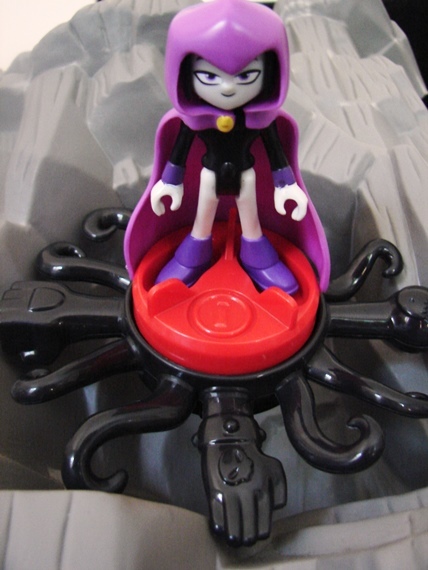 Speaking of the tentacles, they are an ingenious accessory, they make a nice base as well as a rolling 'vehicle': when you push Raven across a hard surface, the tentacles portion of the base rotates! So awesome. And Raven's cape is not only removable, but it stands on it's own. Not positive if the cape has sentience like Dr. Strange's cape, but I think it does. Anyways, I like to imagine it has a life of it's own. The full set of Imaginext Teen Titans GO! figures and playsets can be seen on the back of the package. 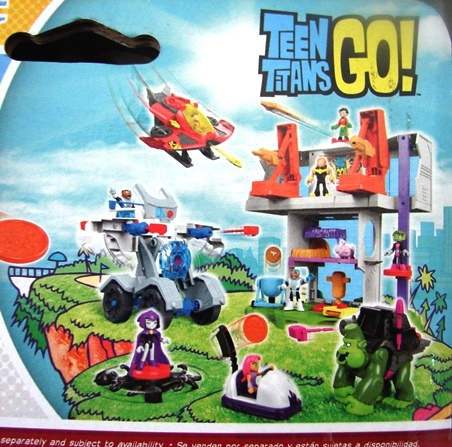 You can get Raven, Cyborg and Starfire at the basic figure level, Beast Boy and Robin at the figure/small vehicle level, another Cyborg at a large vehicle level and another Robin and Mammoth at the Titans Tower playset level. I'm sure Robin will be the figure with the most releases and repaints, and I am optimistic we'll start to see some villains next wave if the theme proves popular. Personally, a Mallah/Brain set is on the top of my wish list! who do you want to see? The basic figures (Starfire, Raven, Cyborg) retail around $7.99 each. I assume the Beast Boy and Robin w/jet sets are probably around $14.99. The Cyborg and large vehicle is probably around $24.99 and Titans Tower will probably retail for around forty bucks. Tune in next week to read my Starfire review! Labels: action figure, Fisher-Price, Imaginext, Raven, Teen Titans, Teen Titans GO! The figure with their respective vehicles is very attractive. The beastboy as ape look good. Ive never been a fan of DC but i can easily sit through a couple of episodes of Teen Titans.The figures look great although i have yet to fall under imaginext's spell.